Pictured are Little Lukes Executive Director Darci Powers, and Program Director Michelle Smith with former Little Lukes students Sammy Haight and Nate Chetney. 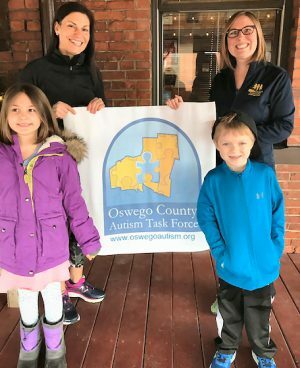 “Starting with the kids kicking off the 5k walk/run will be a great addition to what’s become a family oriented event,” said Race Director and Oswego Autism Task Force board member, Julie Chetney about the April 5k Walk/Run. Children can “out run” Autism on a city-block stretch where they will cross the finish line with medal and cheering supporters who are all there for the worthy cause – in support of OCATF and a Spectrum mission to increase Autism Awareness and creates possibilities for those touched by Autism Spectrum Disorder in Oswego County. The run/walk will take participants through Oswego’s east side, scenic Fort Ontario area on April 7. All runners/walkers looking to celebrate the cause post-race or supporters looking to cheer on runners can meet up at the Press Box and enjoy the “Breakfast of Autism Champions” (from 9 – 11 a.m. for additional cost paid upon service to the Press Box). Proceeds will be donated to the event as well. “We are excited about the addition of the fun run for the kids and giving them the opportunity to support Autism in our community at this year’s 5k,” Chetney said of the event that is on track to have more than 200 participants. There is a fee to participate and all kids will receive a fun run T-shirt and commemorative medal. Registration for both kids’ event and 5k are open by going to www.auyertiming.com. Registration will close on April 5. Limited same day registration spots will be available. Donations can also be made on the site, and all are welcome to cheer on runners at the Press Box the morning of the race.